We were engaged on May 26, 2009 on a gondola under the Bridge of Sighs in Venice, Italy. Therefore, our dream honeymoon was to return to Italy to visit favorite places and explore new ones – and of course to retrace the gondola ride. We planned our trip using Rick Steves’ guidebooks and added some personal touches through our own online research. We were married on May 29, 2010 on the back deck of Frogtown Winery overlooking the vineyards and the North Georgia Mountains. The wedding party stayed at Pura Vida (Dahlonega Resort and Spa), which was just down the road from the winery. Frogtown and Pura Vida are both located near Dahlonega, Georgia. The day after the wedding, we drove to Atlanta for an evening flight to begin our Italian honeymoon. We landed in Milan mid-afternoon the next day. Our first honeymoon registry item was our rental car. After picking up our car, we drove straight to Varenna. We had visited Varenna the year before just as a day trip and were enchanted by its beauty and quiet. We thought that relaxing on Lake Como overlooking the Italian Alps was the perfect way to begin our honeymoon, especially after a busy week of wedding events. We stayed in Villa Torreta in a room at the top of the tower. It was very romantic. A woman by the name of Laura overlooks the villa. She also runs a restaurant and is well known for her stuffed ravioli. We did not eat our first meal with Laura, rather we had our first honeymoon dinner at Ristorante La Vista on the outside deck. The local fish dishes are delicious everywhere in Italy, and that night we had trout from Lake Como. We started the next day with a double espresso from Bar Paninoteca and hiked to Castle Vezio. After touring the castle, we ate a lunch of cured meats at the Ristorante del Castello. We hiked back down, stopping to do some shopping at Ceramiche Vezio glass shop that was tucked away along the trail. That evening, we had Laura’s stuffed ravioli, which was amazing, and then strolled around Varenna. The next day, we took the ferry to Bellagio, were we visited the Gardens at Villa Metzi. After visiting the gardens, we ate lunch paired with wine tasting at Cava Turacciolo, which is an enoteca in a cave-like architecture and has very classy decor. Our wine-tasting host was Norberto, who is owner of the enoteca. After lunch, we strolled around Bellagio, then visited Enoteca Principessa, and then caught the ferry back to Varenna where we relaxed at the lido before dinner. That night we had dinner at Vecchia Varenna, where we had sea bass and trout. Before heading back to our hotel, we stopped at L’Orso Bar nestled behind Laura’s restaurant. The bar owner is named Augusto. He is a wonderful host and makes a great mojito. The next day we drove to Venice, parked at the Tronchetto and took a private taxi down the Grand Canal to St Mark’s Square. Our hotel (Hotel Cavalleto) was just a short walk from the dock. We had a canal-side room with a wonderful view. After unpacking, we went for a walk and sat in St. Mark’s Square enjoying a glass of wine while listening to the dueling orchestras. That night we ate dinner at one of our favorite restaurants in Venice, Ristorante La Nuova Grotto. This restaurant has amazing service and the food is out of this world. We had lobster and fresh mushrooms for appetizers, Turbot (a local fish) for an entree and an after-dinner drink made with lemon sherbet and champagne. The plates are prepared and the drinks made tableside, which provides both elegance and entertainment. The next day, we strolled around Venice and visited the Academy Galleria. After touring the galleria, we ventured to Enoteca Cantina Del Vino Gia Schiavi for cichettis and wine-tasting. Next, we winded our way through the streets, stopping at another enoteca (Osteria Enoteca S.Barnaba) and ending at Harry’s Bar for their famous belinis. That evening we had dinner at the Grand Canal restaurant where we had fish soup, monk fish, and beef with capers. After dinner, we strolled back toward our hotel and stopped off at the Devil’s Forest Pub and then purchased pizza from a street vendor. The next day we took a private boat to Murano to visit Fornance Venier Factory. After watching the glass-making demonstration, we walk through the showrooms and made a few selections. Then we took a ferry to Burano to see the lace creations and the colorful buildings. After a quick stroll around Burano and making a few purchases, we took a vapareto back to Venice. Our task before the evening’s events was to find a mask to match Deb’s wedding dress because she had brought it along for the gondola ride. We found one that looked as though it was made for her dress. This year our gondola ride began in the Grand Canal but then turned down a side canal to retrace the route from our engagement. Roberto Nardine arranged our ride. He was the head gondolier for the St. Mark’s gondolier station. Matt had met Roberto’s cousin, Michael, during his bachelor weekend, and Michael had given Matt Roberto’s contact information. The gondola ride was very romantic as we sipped wine and enjoyed a serenade as we floated down the Venice canals. Our gondolier even stopped under the Bridge of Sighs, providing us the opportunity to repeat our Declarations of Love from our wedding ceremony. The gondola ride ended at our restaurant for that evening, Trattoria Da Giorgio Ai Greci, which is also were we had our engagement meal the year before. This restaurant is family owned and operated and is another of our favorite restaurants in Venice. We had our same canal-side table with a wonderful view. The food was amazing and the service impeccable, being guided by Robert (Bob), whose father (George) is owner. We ordered cuttlefish in ink sauce with pasta and Snapper. While waiting for our meal, Matt bought Deb a bouquet of roses, her second bridal bouquet. We posed for pictures on the bridge by the restaurant, and then sat down for our meal. After dinner, we walked back toward St. Mark’s Square, stopping at the Bridge of Sighs and then dancing to the music by the jazz orchestra on St. Mark’s Square. We then strolled the streets of Venice to Rialto Bridge and then back to our hotel. The next day we strolled to the San Polo region of Venice where we would be attending the La Traviata Opera that evening at Scuola Grande di S. Giovanni Evangelista. We had lunch at Trattoria Taverna Capitan Uncino. We strolled back to the hotel to dress for the opera. Before the opera, we dined at Ganesh Ji Indian restaurant, where we had mutton in spicy curry, lamb baked in a traditional oven, and mango ice cream for dessert. The opera was wonderful, and afterwards, we enjoyed a night stroll stopping at Taverna da Baffo for Birra (Forst) poured into special glasses. After finishing our beers, we continued our stroll, stopping at Enoteca Mascareta for a glass of wine. There we met a man named Fabio who owns a bed and breakfast (Ramo dei Padavani) near the Bridge of Sighs. Fabio took us for a midnight boat ride through the canals. We sipped wine as we rode and listened to Fabio explain to us some of the Venetian history. Our last day in Venice was spent at the Lido, where we found a wonderful beach lounge. That night our dinner was at Al Mascaron Osteria, a restaurant recommended by Fabio. The restaurant had wonderful beer and the food was fantastic. We ate steamed clams and homemade pasta with spider crab. The next day we drove to Siena, where we stayed at Hotel Palazzo Ravizza. The view from our room was breathtaking. After getting checked in, we walked to Il Campo and climbed the tower (Torre del Mangia) for a grand view of Siena and surrounding Tuscany. After the tower, we walked to the Duomo and toured through the Duomo and then to the Duomo museum, where we climbed to the top for a panoramic view of Tuscany. We had definitely worked up an appetite and were ready for dinner. Our restaurant of choice was closed that evening, so we took the advice of the hotel staff and dined at Osteria Le Lecche. The service and food were subpar, except for the appetizers of duck and dumplings with mushrooms. We started the next day with espresso and then drove through Tuscany. Our first stop was Banfi Castle, where we had a light lunch of cheese and meat. After making our wine selections (aided by Paul) to be shipped back to the States, we continued on to Montalcino. In Montalcino, we visited the enoteca at the castle (Enoteca La Fortezza di Montalcino) where we were helped by Allesandro in our wine selections. The Brunello selection was fantastic and we made several choices to ship to the States, and included two bottles to enjoy during our stay in Italy. We then drove to Caparzo Winery, were we had a wonderful time listening to our wine-tasting host Andrea tell us about growing grapes and making good wine. We made our selection of wines for shipment and then were ready to return to Siena. That evening, we dined at Da Divo. This restaurant had amazing ambience with many dining rooms, each with unique décor. We had an anchovie-type fish, pasta with venison, stuffed ravioli with fish, ginny fowl, and stuffed pork. After all of that food, we ordered our dessert of Canolis with chocolate to go, but not before having espresso and cookies! The next day we drove again through Tuscany but this time to Panzano to visit Dario the Butcher. Dario Cecchini and his wife (Kim) operate a meat market that is known around the world. Across the street, they have a restaurant where they serve meals prepared from their select cuts of meat. Dario also makes his own beer, which is fantastic. We made purchases of salami, beef, pepper jelly and beer, all the while eating some of his pork pate that was available to customers. The meat market is a busy place so we strolled around town, while our order was being prepared. After picking up our order, we continued on to Antinori Winery where we had lunch in Osteria Di Passignano. The lunch was paired with a wine-tasting. Lunch included a welcome appetizer of olive oil butter with bread, followed by beef tenderloin and an amazing cheese plate that included cheeses from sheep, goat and cow. After lunch, we continued on to Greve in Chianti, which is one of our favorite wine shops. This shop is in a basement across the street from the wine museum. The shop sports wine, grappa, and olive oil from all of the regions of Italy. After making our selections of wine and olive oils to ship back to the States, we made a final wine selection to take with us to our hotel room. We toured a bit more around Tuscany and then headed back to Siena. In Siena, we went to Pizzicheria De Micolli, where we met Antonio the butcher and sampled wonderful meats and cheeses. He served us slices of pork with 9-year old balsamic vinegar and a glass of Chianti. We made our selections and headed back to the hotel, where we sat at our window overlooking Tuscany, eating our meal of meats and cheeses, and sipping a glass of wine that we purchased earlier in the day. The next day we traveled to Sorrento. It was a five-hour drive with beautiful scenery. Matt made use of the time to begin logging the events that we had experienced thus far. Our hotel in Sorrento was La Tonnarella Hotel. Just when we thought nothing could have topped the view we had just left, we were blown away by the large deck and amazing view of the Tyrrhenian Sea. We relaxed on the deck with our Tuscan meats and spreads and shared one of Dario’s beers with a slice of lime and lemon plucked from the trees on our deck. We also enjoyed a glass of wine that we had purchased in Bellagio from Norberto. That night we walked to downtown Sorrento and ate at Il Buco. This restaurant has an amazing romantic atmosphere with tables that are tucked away surrounded by partial walls and vegetation to add to the intimacy. We started with a glass of prosecco but had brought along a 1991 Brunello for our meal. The waiter poured it into a decanter to allow it to breath before serving. The food was wonderful with a raw fish appetizer and first course of ravioli stuffed with octopus and calmari with pasta and pesto. Our main entree was sea bass and dentice (a local white fish). We had our first taste of lemoncello after dinner with our tiramisu dessert. After dinner, we found an English pub on mainstreet, had some Gelato and then ventured back to the hotel and relaxed on our deck gazing at the sea and the city lights. The next day we took a day trip to Pompeii to see the ruins, which were amazing. After walking through the ruins, we were more than ready for lunch. We drove into Napoli for fantastic pizza at L’Antica Pizzeria de Michele. It was a good thing we were hungry from all of that walking around the ruins! After lunch, we headed back toward Sorrento. As we neared Sorrento, we stopped along the road to enjoy the view and to purchase some lemon drinks at a roadside lemon stand. The stand operator even gave us a lemon to go. It was as large as a softball! After relaxing for a bit on our deck, we headed downtown to Chaplin’s Irish Bar to watch the USA-UK soccer match. The owners of this establishment are Maria and Luigi and they are wonderful people. We watched the match with folks from Scotland and England. After the match, the floor was cleared of the tables and chairs and we danced to American music till near closing. We headed back to our hotel excited about the next day, which was a day trip to Capri. The next morning, we took the ferry to Capri. Immediately upon arrival to Capri, we first boarded another boat to travel to the Blue Grotto. Unfortunately, the waters were rough and the wait was long so we opted to take the next boat back to the dock and rented a scooter to begin our island tour. This was a fantastic way to see the island. We stopped along the way to enjoy the amazing views. The view from Anacapri was especially breathtaking. We stopped for a break at Fado Beach where we took a dip in the water and then climbed the rocky beach until we found a spot to call our own and enjoy some sun. We ventured back toward town but stopped along the way on the South Coast at Marina Picollo for lunch at Terrazza Ciro a Mare. Our lunch included mussels and clams and octopus salad with Capri wine. It was wonderful and the view was breathtaking. After turning in the scooter, we caught the boat back to Sorrento. After arriving in Sorrento, we walked through Sorrento Park, heading back to our hotel. At the hotel, we enjoyed our wine from Greve in Chianti with Tuscan meats and cheese. That night we had dinner at Ristorante Delfino, where we had dumplings with fish, egg plant lasagna, bream and prawns. We enjoyed a bottle of Delfino wine with our meal. We were exhausted after our day on Capri and we headed straight back to the hotel. The next day, we had breakfast on our deck and then spent a few hours at the hotel lido. It was very relaxing and the water felt wonderful. After a light snack on our deck, we went downtown to do some shopping. We headed back to the hotel and dressed for dinner. That night we had dinner at L’Antica Trattoria, where you felt as though you were dining in a beautiful garden. The meal was wonderful and included mixed raw fish and mullet appetizers, pasta and stuffed ravioli, oven baked fish, lamb chops, and an amazing tomato side dish. After our meal, we ventured to the Irish bar to watch Italy play soccer, and do some more dancing after the match. We then walked to a new bar called Sweet Dreams and ordered a sausage panini to go while we waited for our cab back to the hotel. The next day, we drove to Rome. Our hotel was Hotel Nationale. We were upgraded to an executive suite because it was our honeymoon. The room was amazingly large with tall ceilings, huge windows and a view overlooking the Piazza di Montecitorio. We had a glass of prosecco and some of Dario’s beer along with a snack of Tuscan meats, while watching Avatar. We then ventured out and walked around the pantheon and four rivers fountain area. That night we had dinner at Ristorante Da Fortuna. We had a local fish for our entre along with tortellini soup. After dinner, we walked to Trevi fountain and then stopped at Giolitti for shaved ice, one with raspberry and mixed fruit and one with lemon and melon. The next day started with espresso at Sant Estuchio, which is the most amazing espresso (secret recipe)! We then walked to Piazza della Republica and toured the Santa Maria Della Angelica Church (old baths of Diocletian), followed by the National Museum. After touring the museum, we ventured to Enoteca Cavour 313 for lunch with wine tasting. Our lunch included a 12th century cheese that is kept underground. It was amazing! After lunch, we walked through the Roman Forum and then the Capitalina Museum where we climbed to the bar for a view from the terrace. That night we had dinner at our friends Steve and Grazie, who live on historic Giulia Street, and after dinner we ventured for gelato at Gellataria Del Teatro. The next day, we walked to the Bridge of Angels and Vatican museum. We saw the Sistine chapel and climbed to the top of St. Peter’s Basilica. After all of that walking we found a spot for lunch, enjoying a cold beer, Gnocchi (potato dumplings) and mixed cheeses. 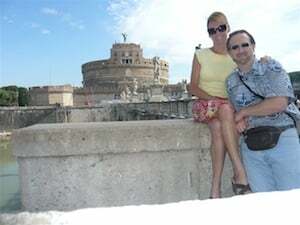 After lunch, we went to the Castel Sant’ Angelo and climbed to the top for a view of the Tiber River. Heading back to the hotel, we stopped first for some Gelato at Giliolliti. We relaxed in the room before dinner. For our last night in Rome we ate dinner at Ristorante Da Pancrazio (site of the Pompeii theater). The restaurant has amazing architecture from the theater and it is a great place to stop, just to see the rooms. Our dinner included stuffed ravioli, lamb chops, grilled squid and roman artichokes. After dinner we strolled toward the four rivers fountain area and finished the evening with a romantic carriage ride around Rome while sipping Brunello. Our coachman was named Christian and the horse was Zagreb Trio. After an amazing carriage tour of Rome, we were dropped off at our hotel. The next day we drove to Pisa, where we stayed at Hotel Kinzica. Our room had a balcony with a fantastic view of the Leaning Tower. That afternoon, we met with a colleague, who toured us around Pisa, telling us about the history of the town and giving us pointers on foods to try and places to see. That evening we sat on a square near Ponte di Mezzo Bridge eating pizza and calzone while watching the England-Algeria soccer match. After the match, we walked to the microbrewery (Orzo Bruno) for some amazing unfiltered beer. Before heading back to the hotel, we ordered a spicy Indian burrito at Terma Kebab, and enjoyed the view of the Arno River. Our final stop before the hotel was for gelato. The next morning it was raining, so we had a relaxing morning in our room until the rain slowed to a light drizzle. Then we walked to the Enoteca Borgo Di Vino for some wine tasting. We then had a late lunch at Hosteria Pizzeria le Repubbliche Marinare. Lunch included oysters, ravioli stuffed with mullet, fresh water prawns, grilled vegetables, and Nipozzano and Vermentino wines. After lunch we went for a stroll around Pisa, stopping at a church and then venturing to the Field of Miracles to climb the tower for the breathtaking view. For our last night in Pisa, we had sushi at a restaurant that we had found while strolling through town. The uni was wonderful! After sushi, we strolled through the streets, visiting a few local establishments and then stopping for kebabs at the Violin. On our way back to the hotel, we bought a Napoli style pizza with anchovies to go. The next day we drove to Milan. We first dropped off our luggage at our hotel (Ramada Inn). We then returned our rental car and by the time we arrived at the airport, our gas tank was on empty! We caught the shuttle to our hotel and relaxed for our last night in Italy. We sat in the hotel lounge for happy hour and enjoyed the local dark beer Birra Abba (Nigra). For dinner we had a rabbit appetizer, seafood pasta appetizer, a salad with anchovies and olives, followed by suckling pig for an entree. Our meal was paired with Sicilian wine. We had an early flight the next day and touched down in Atlanta in the mid-afternoon. The total cost of our trip was $12,500, including airfare. We raised $6,200 with our Traveler’s Joy website. We received numerous complements from our guests about our website. They enjoyed having the opportunity to contribute to our honeymoon experiences. By purchasing an item, our guests felt like they were a part of our Italy trip. Many guests commented on purchasing an item they wanted to experience most. During our honeymoon, we took pictures of us experiencing each registry item and included images in our thank you cards. Traveler’s Joy helped us cover the cost of our honeymoon but also share our experience with family and friends. Traveler’s Joy truly helped us experience our honeymoon dream!